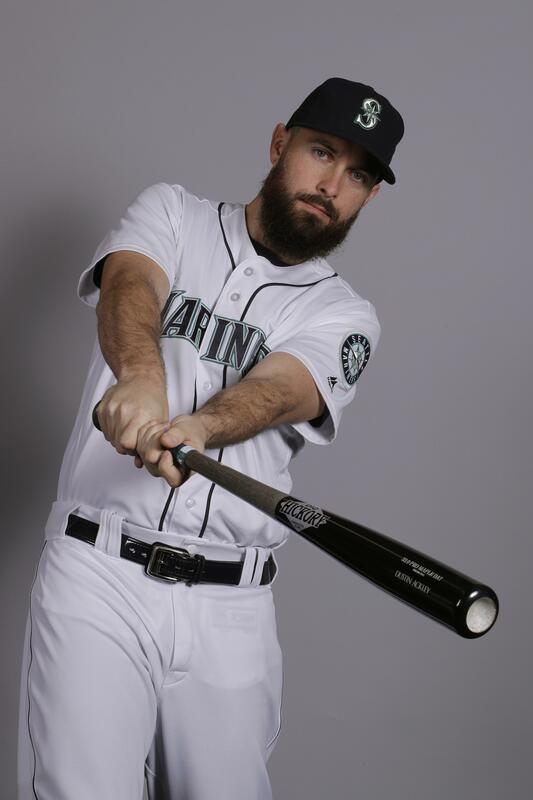 UPDATED: Thu., Feb. 21, 2019, 5:05 p.m.
PEORIA, Ariz. – In a Mariners camp brimming with the promise of its youthful core, Dustin Ackley can be viewed as a cautionary tale of how such promises are not always fulfilled. That’s the cynical outlook, anyway. On a more humanistic level, Ackley’s presence in Seattle’s camp is a poignant example of the vagaries of baseball and how the tug of the game is not easily relinquished. Once hailed as the franchise savior, Ackley returns on the bottom rung of the clubhouse hierarchy – a nonroster invitee with almost no chance to make the roster. He is six days shy of his 31st birthday, and both realistic and hopeful. Ackley’s initial chance, if it comes, almost certainly would occur with Triple-A Tacoma. It’s a far cry from the fanfare that surrounded his rapid – too rapid, in retrospect – rise through the Seattle farm system after being drafted No. 2 overall in 2009. From his electric introduction – a triple off Phillies lefty ace Cole Hamels in this third career game at sold-out Safeco Field – through his subsequent fall from grace, Ackley tried everything to pull out of what seemed to be a perpetual slump. A series of second-half surges allowed him to “at least not make a fool of myself a little bit,” in Ackley’s words, but they always proved to be mirages. Ackley revamped his swing on multiple occasions, sometimes to unseemly proportions. He studied treatises on the mental side of baseball. Everyone seemed to be whispering in his ear with advice, and he didn’t know who to follow. Somewhere along the way, Ackley lost the unfettered joy of the game that infused him as a can’t-miss prospect out of North Carolina. He doesn’t think the pressure of being the pick right after Stephen Strasburg (in the same draft that yielded Mike Trout in the 25th slot) got to him, but maybe the pressure of performing in the major leagues did. He doesn’t deny that he took his failures to heart. Mariners third baseman Kyle Seager, his college teammate at North Carolina, remembers those days when Ackley was a hitting savant who inspired nothing but awe. Seager is rooting unabashedly for his friend’s comeback. A third-round pick in the same ’09 draft, Seager blossomed into an All-Star who nailed down a seven-year, $100 million contract extension in 2014. The Mariners, meanwhile, traded Ackley to the Yankees for two long-departed minor leaguers in July 2015, when his average dipped to .215. He had a brief rejuvenation in New York and made its playoff roster, but a shoulder injury wiped out his 2016 season. Ackley has been flailing ever since. In 2017, he signed a minor league deal with the Angels, but the shoulder bothered him most of the year and limited him mostly to DH work at Triple-A Salt Lake. Last year he went unsigned until early April, when the Angels again brought him to Salt Lake after a month at extended spring training. As a utility man, Ackley flirted with .300 most of the season and wound up at .286 (with a .378 on-base percentage). He was finally healthy. He was able to retain his stroke despite sporadic playing time. The slumps were quickly nipped in the bud. All that cemented in Ackley’s head that he’s not ready to give up the dream. He looks at players like Rich Hill of the Dodgers, who was stymied in the Independent League before forging a second act to his career in his 30s that resulted in a three-year, $48 million contract. It’s the “who knows” part that will always keep the Ackleys of the world coming back. And, on a larger scale, in a clubhouse full of can’t-miss prospects, it’s the mystery that will determine the success of the Mariners’ rebuild. In the first major league exhibition game of the year, the Seattle Mariners and Oakland Athletics were rained out Thursday. The Mariners roughed up Jerry Blevins and led 5-0 in the middle of the second inning when it was called. The Athletics and Mariners started early to give them time to prepare for their upcoming trip to Japan, where they’ll play regular-season games on March 20-21 at the Tokyo Dome. The Mariners and A’s are set to try again Friday in Peoria, although the weather forecast isn’t much better. Published: Feb. 21, 2019, 4:33 p.m. Updated: Feb. 21, 2019, 5:05 p.m.